NEW! 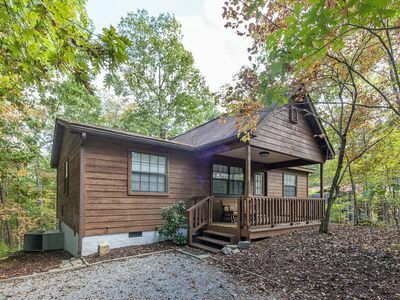 Cabin w/ Hot Tub - 4 Miles to Pigeon Forge! 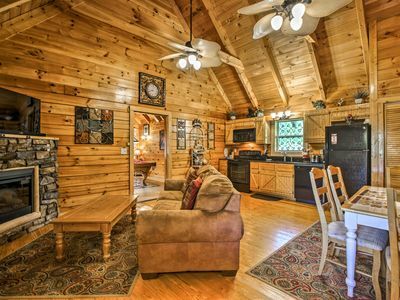 Make your visit to Sevierville one for the books when you stay at this 1-bedroom, 1-bath vacation rental cabin with accommodations for up to 4 guests. 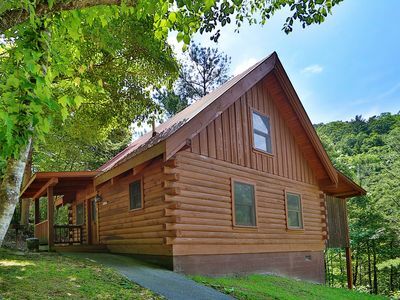 Situated just 4 miles to Pigeon Forge, 8 miles to Gatlinburg and 12.5 miles to Great Smoky Mountains National Park, this home offers the quintessential getaway to experience the Appalachian Mountains. 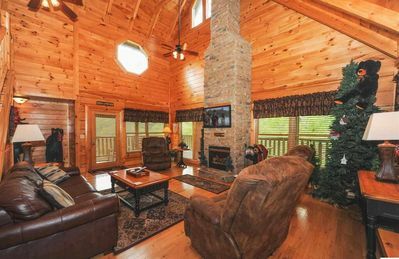 When you're not exploring nearby attractions, enjoy all the comforts of this contemporary cabin with a hot tub, pool table and electric fireplace. 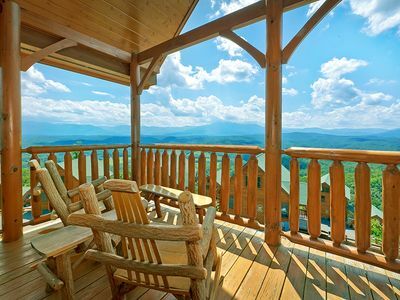 Boasting a wood-paneled 775-square-foot interior and a spacious front porch overlooking a sylvan setting, this cabin promises an unforgettable Sevierville vacation. 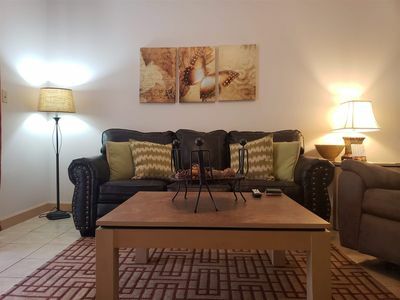 Settle down in the decorative living area onto the plush sofa for a movie on the flat-screen cable TV. Turn on the immaculate electric fireplace to add a subtle glow to your new home-away-from-home. When everyone has worked up an appetite, make your way into the fully equipped kitchen. While the steaks are sizzling on the charcoal grill, there’s ample room to prepare a few sides on the granite countertops. 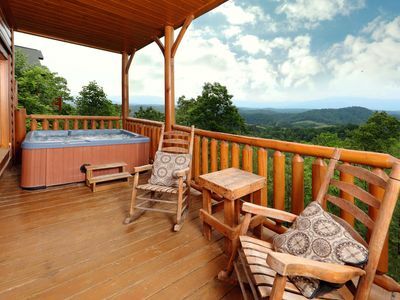 After spending the day at the Great Smoky Mountain National Park, soothe your muscles in the full-sized hot tub which faces a private, wooded view. 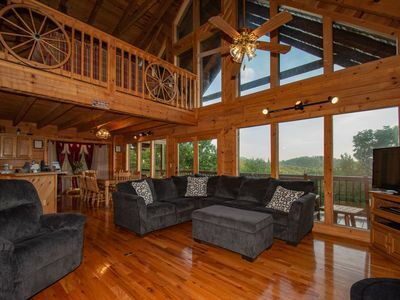 Play a friendly game of billiards in the game room before pouring yourself a nightcap on the porch. 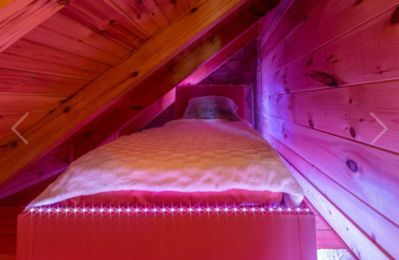 When you're ready to fall asleep, the bedroom is outfitted with a king-sized bed, romantic whirlpool, flat-screen cable TV and en-suite bathroom. 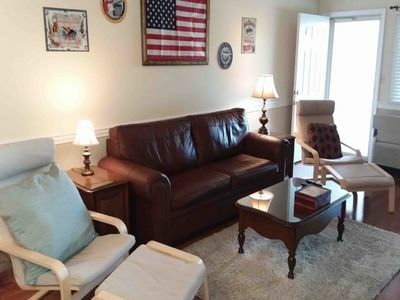 When the others are ready to turn in, they can delight in nights of peaceful sleep on the additional sleeper sofa. 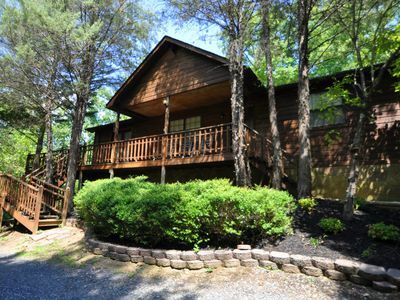 This relaxing mountain retreat is centrally situated near all the top attractions in the area. 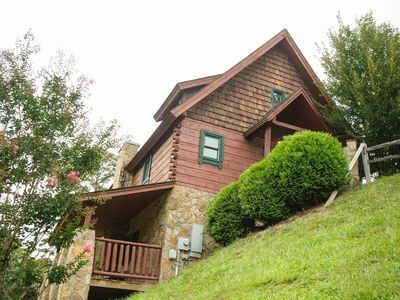 Start the adventure just 4 miles from your door in Pigeon Forge where you can experience the famed Dollywood, Titanic Museum, Parrot Mountain & Garden, and The Island. Grab your camera and lace up those hiking boots before heading out to the Great Smoky Mountains National Park. 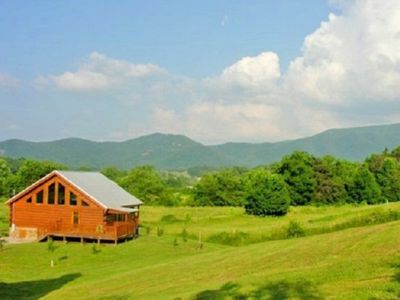 World-renowned sites and trails await, including Roaring Fork Motor Nature Trail, Cades Cove, and Clingmans Dome, where you're sure to see plenty of wildlife. 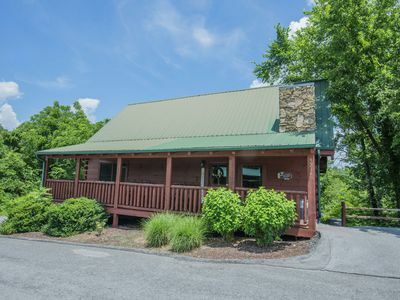 In the winter months, you’ll look forward to alpine skiing or snowboarding at Ober Gatlinburg. 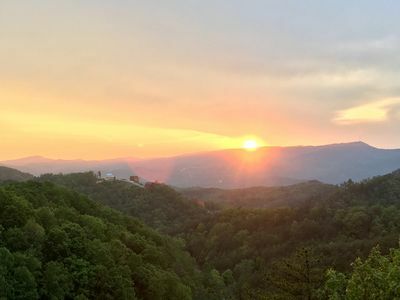 Before heading home, walk the historic streets of Gatlinburg exploring local attractions, like Ole Smoky Moonshine, Ripley's Aquarium of the Smokies and the Hollywood Star Cars Museum. 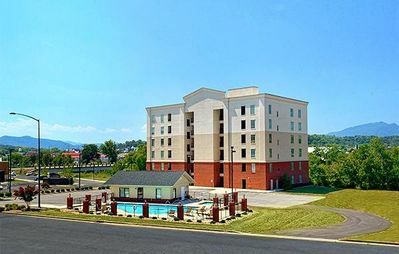 - Unbeatable Pigeon Forge location - 4 miles from Dollywood, the Titanic Museum Attraction, Parrot Mountain & Garden, and Dolly Parton's Dixie Stampede - 8 miles to Gatlinburg attractions, including Ober Gatlinburg, Ole Smoky Moonshine, Ripley's Aquarium of the Smokies and the Hollywood Star Cars Museum - 12.5 miles to the Great Smoky Mountains National Park! 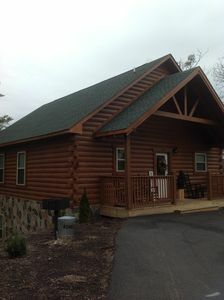 Cabin Sleeps 8 w/ 2 King Suites, Theater/Hot Tub/Pool Table, Small Dog Friendly! 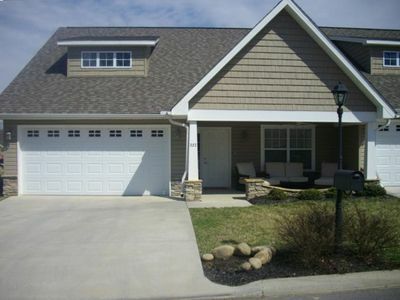 ERN819 - MOUNTAIN MAJESTY - GREAT LOCATION! CLOSE TO ALL THE ACTION! 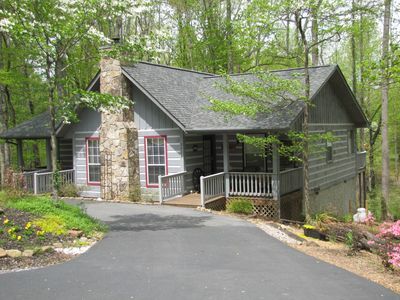 "Smokies Hideout" is a custom-built cabin nestled in the woods just minutes from Dollywood. 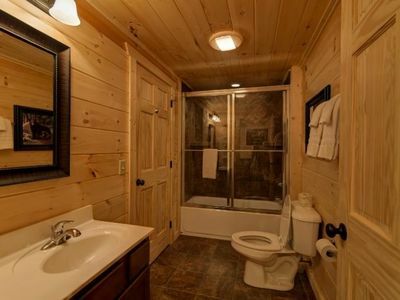 Private Log Cabin with great view! 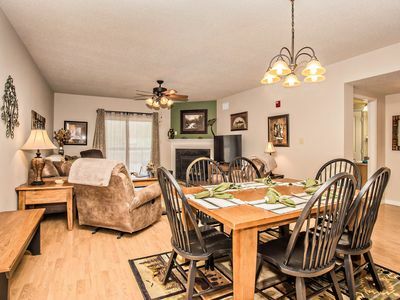 Americana-Themed Condo in THE HEART of Pigeon Forge! !